The island has become one of the most desired items in any kitchen, and for good reason. With houses increasingly open--plan in their design, the traditional idea of the kitchen has been redefined. Modern kitchen design allows for the inclusion of sinks, hobs, ovens and dishwashers and more in kitchen islands; their design has moved far beyond the simple breakfast bar. If you're looking for more space to to work at or sit at, a kitchen island is the ideal 'functional element' for your kitchen. 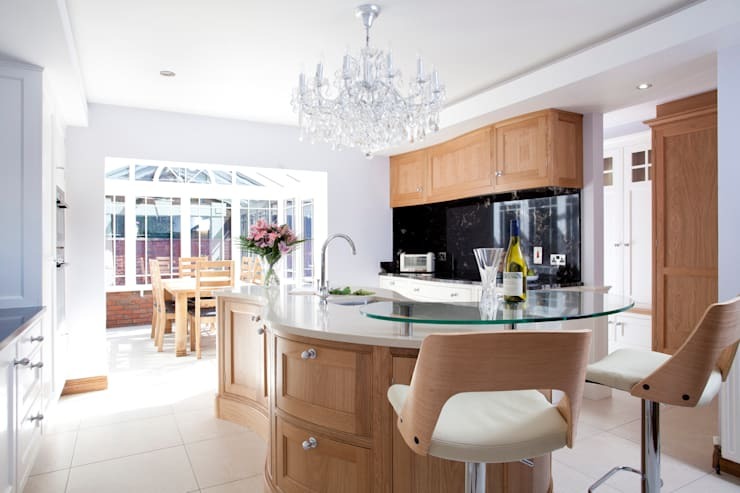 Kitchen islands invite sociability, placing kitchen tasks like cooking or washing up right at the centre of the room, rather than hidden off to one side. An island with integrated seating means everyone will gravitate together in the same place, whether they're working, eating, or just hanging out. No wonder they've become so popular! 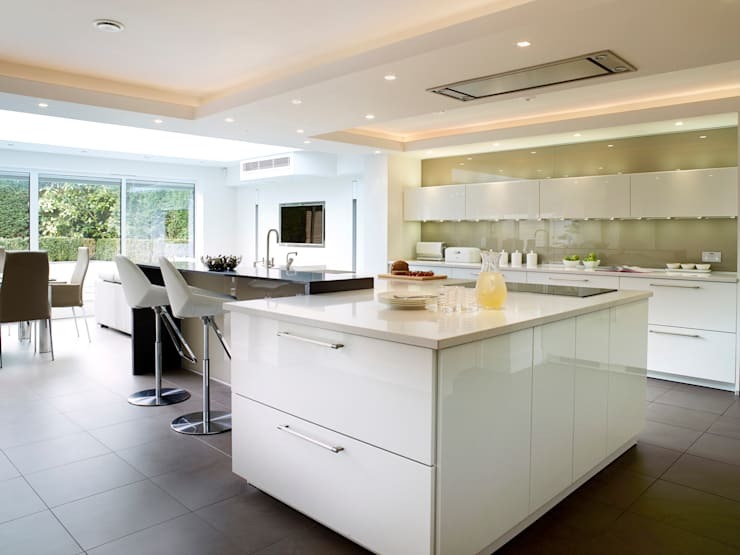 Open plan design is much more than just a buzzword; far from it, it usually serves some very functional purposes. Not only do homes with lots of open space look great, but an open-plan design helps to bring together the occupants of a house at a time when our life can seem more and more detached and isolated. So while mom or dad prepare dinner, the children can do their homework at the table, or on the couch, while still chatting and interacting with their parents. 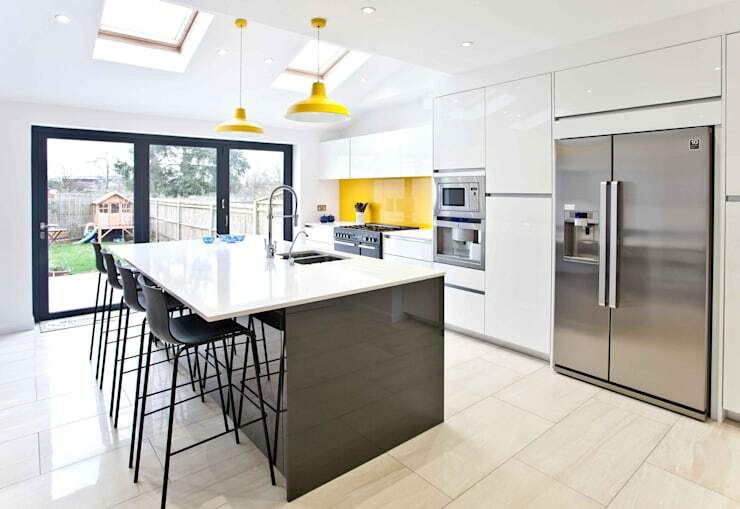 The beautiful kitchen island in this photo strategically bisects the open plan design of this home's ground floor, with each 'arm' of its L-shaped design marking out different functional zones in the room. Kitchen islands today are more than just workspaces, and more often than not, they will be constructed to serve more than one purpose. Along with food preparation, cooking, and washing dishes, the islands are also great places to eat our own culinary masterpieces. An island with a generous 'lip' protruding from one side can instantly become a bar space, saving the space that would be occupied by a dining table, or offering a place for a quick breakfast. If a bar space isn't enough for you, or you don't like eating at a height, a kitchen island with fold-out table is the perfect solution—and a great space saver! 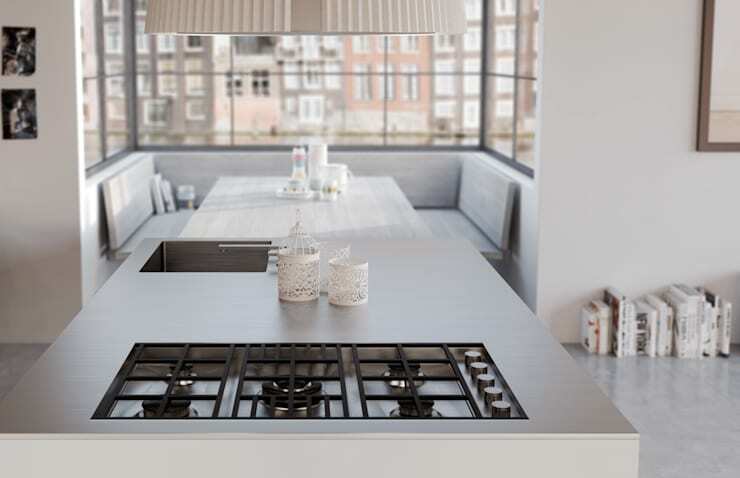 If your kitchen is only just big enough to fit an island in, the availability of smaller ones with fold-away dining tables means you don't have to abandon your island dreams just yet. Choose stacking chairs that can be piled neatly in a corner when not in use. Integrating a hob into a kitchen island means that cooking can become a sociable activity. Rather than hunching over a hob set into a countertop against a wall, with your back to family or guests, the cook becomes the centre of attention and activity—where he or she should be! Nothing in the rulebook demands that kitchen islands have to be boxy, with sharp edges. Curves, or waveforms—see the picture below—will add texture to a kitchen design, and soften it. 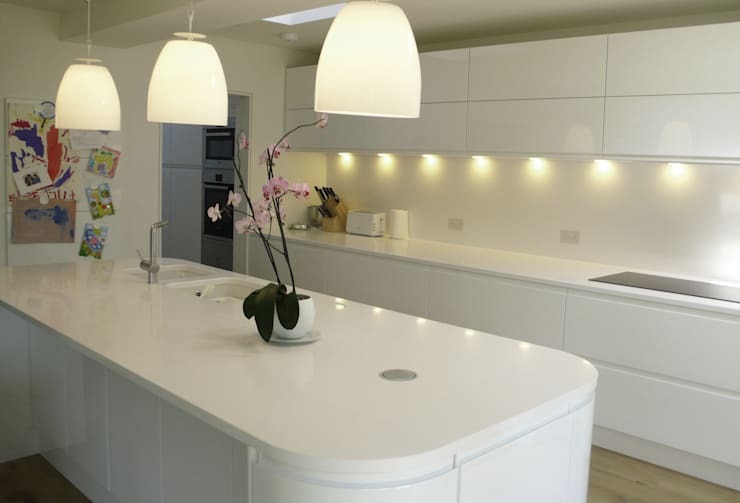 As functional, practical spaces, a degree of softness can be a very welcome addition to a kitchen, speaking to its role as a place of sociability as well as work. Following through on curved corners with soft, curved light fittings will only add to this sense, making the space welcoming and elegant. To highlight an area as important as a kitchen, what could be better than a beautiful chandelier, or other striking pendant light, hanging right over the island? As a work space, and island needs good illumination, but with an eye-catching chandelier or pendant, we solve the practical problem of light, while also adding a touch of style. 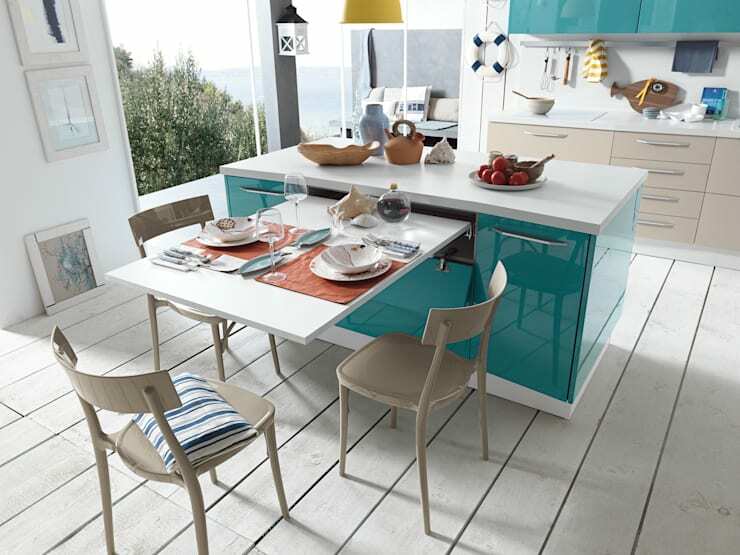 Have you seen any great design ideas for kitchen islands? Let us know about them in the comments!